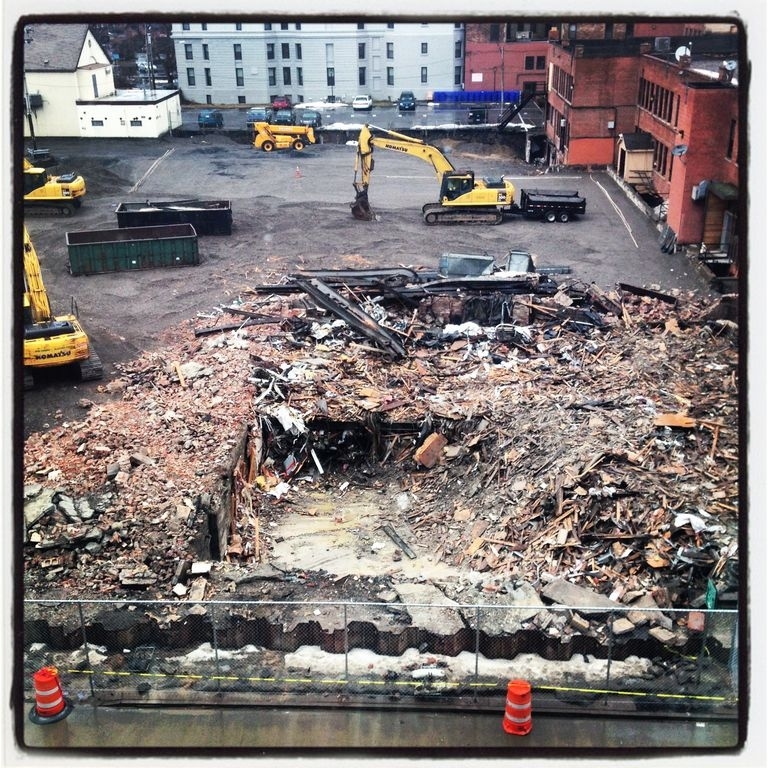 A pile of splintered wood and broken bricks was all that was left of the Buffalo United Artists Theatre last week. The worst curse and greatest virtue of theater its impermanence. That idea should have been comforting last week, when I drove past the pile of splintered wood and crushed brick that used to be the Buffalo United Artists Theatre. That space, part of the Delaware Court Building that has been leveled to make way for a new glass office tower, was home to the small theater company after which it was named for five short years. Upon its opening, BUA founder Javier Bustillos was clear-eyed about its prospects for theater's permanence, telling the inaugural crowd that it would be the company's home for “the next, at least, five years, we hope.” He was off by only a few months. After a brief period during which Bustillos considered shuttering the company, BUA's stalwart members picked themselves up, dusted themselves off and returned to the itinerant status they'd known for the first 17 years of their existence. The company will open a production of “Blanche Survives Katrina in a FEMA Trailer Named Desire,” starring audience favorite Jimmy Janowski, on Friday in the Main Street Cabaret. However in love with impermanence actors like O'Toole and theater people like Bustillos are, I can't help getting pangs of nostalgia for the quirky space that was meant to be BUA's longtime home. With its tiger-print carpeting and harsh LED lights that sometimes bathed actors in unnatural tones, there was something comfortably ad-hoc about the room. There was something wonderful, too, about the way BUA actors gracefully ignored or occasionally incorporated the muffled bass from the bar next door thumping through the thin walls, the same way an actor in Delaware Park deals with a screaming police siren or passing jet. Like many of BUA's faithful fans, I spent more memorable Friday nights in that space than I can count. Those experiences and performances are hazy memories now, but one or another of them will always come to mind every time I pass by the rubble and the tower that will soon rise out of it. One of my favorites was during its official opening in May, 2009. The theater community had gathered to help Bustillos celebrate his wandering company's homecoming and to watch a staged reading of “The Ritz” by one of the company's favorite playwrights, Terrence McNally. This was not a performance so much as a party, with members of the crowd yelling at the actors and vice versa, only to occasionally meander back to the side-splitting script. By the time the evening was over, every last person in the theatre was wearing a mile-wide smile and sharing the same thought: that they'd finally come home. The following September, I watched longtime BUA company member Chris Kelly turn in one of the most sensitive performances I've witnessed in “The Pride,” as a man casting about for meaning in his life and constantly coming up short. Not long after that, I saw the young performer Jonathan Young for the first time in “Secrets of the Trade,” in which he brought his character so fully to life opposite BUA favorite Jimmy Janowski that I had to frequently remind myself that I was only watching a play. And I'll especially remember that moment, during a 2009 production of “The Tragic and Horrible Life of the Singing Nun,” when I found myself in the midst of dutifully scribbling down notes and realized the impossibility of capturing the ineffable absurdity of that particular show. I set my notebook down, let it all wash over me and left the theater in a much better mood than I'd entered it. None of those experiences, of course, depended on the peculiarities of that singular space. Wherever the company goes in the future, crowds are sure to follow. And I suppose its natural that theaters, like the performances they host, only last for so long. God knows Downtown Buffalo is a graveyard for long-ago demolished theaters, the Erlanger and the Teck perhaps the best remembered among them. When these things happen, it's useless to shed too many tears. You just have to be happy you were there.